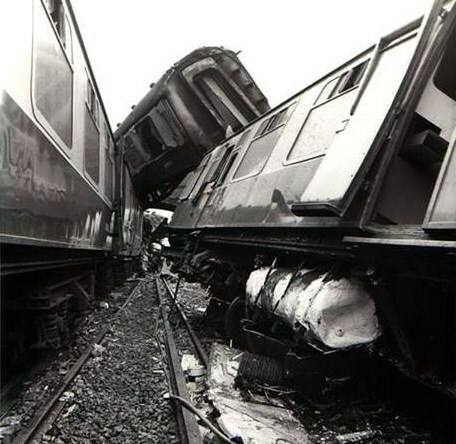 On Tuesday, 19th December 1978, at about 23.22, collision between two passenger trains that occurred between Hassocks and Preston Park on the London to Brighton Line in the Southern Region of British Railways. Shortly before 23.20, the 21.50 London (Victoria) to Brighton electric passenger train, formed of 12 coaches, was brought to a stand at Signal CA.4 some 506 yards north of Patcham Tunnel. 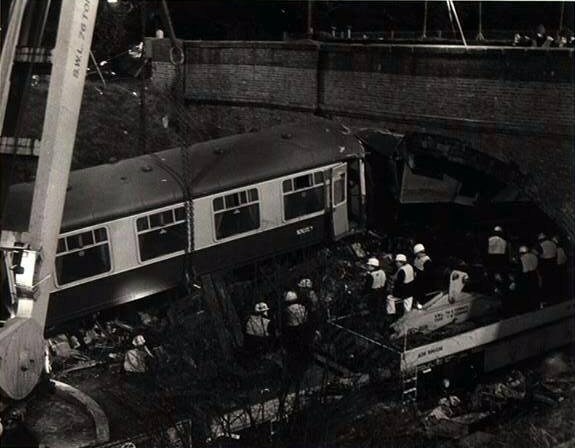 At 23.22 it was struck violently in the rear by the 21.40 Victoria to Littlehampton electric passenger train, formed of 8 coaches. The driver of this train had received a single yellow (caution) aspect at signal CA.164, just over 1 ½ miles in rear of Signal CA.4, but the train's speed had not been significantly reduced by the time it passed the next signal. CA.6. This signal. which should have been showing a red aspect protecting the rear of the 21.50 train, was almost certainly unlit as the 21.40 train passed it. The train continued at speed until the driver made an emergency brake application on sighting the stationary train ahead. The brake application had little time to take effect and the train was still travelling at between 45 and 50 mile/h when it ran into the back of the one in front. The collision was very destructive and I regret to report that one passenger, together with the driver of the 21.40 train and another railwayman, who was on duty but travelling as a passenger, lost their lives. One passenger was seriously hurt, 6 were taken to hospital but were allowed home after treatment: and a further 50 received minor injuries. The emergency services were called at 23.29 and commenced to arrive on site from 23.34 onwards. The collision blocked both lines and clearance of the wreckage and repairs to the track took until 04.10 on Saturday, 23rd December. Tribute was paid at the public hearing to the work of the emergency services - Fire, Police, and Ambulance - in rescuing and attending to the injured and to the efforts of all those concerned with searching and clearing the wreckage and re-opening the line. On 20th March 1979 I acted as Assessor to Her Majesty's Coroner for the Western District of East Sussex at the inquest into the deaths of those killed in the accident. Between Hassocks and Preston Park the London to Brighton line is formed of two tracks, Electrified on the conductor rail system at a nominal 675 V dc, and runs approximately north to south. From Hassocks the Down line climbs, for much of the way at 1 in 265, and after a mile enters the 2,259 yard long Clayton Tunnel. On leaving the tunnel the line descends at varying gradients through steep-sided chalk cuttings and some 982 yards south of the tunnel it enters a long left-hand curve of 80 chains radius. Where the cuttings begin to run out the line is crossed by two brick arch bridges, the southernmost of which is officially called Brapshole South Bridge but is known locally as Sweet Hill. It was near this bridge that the to Preston Park Station. Between Preston Park and the terminus at Brighton trains for Littlehampton leave the main line and pass over a linking line to join the Brighton to Portsmouth coastal route at Hove. Between Hassocks and the south end of Clayton Tunnel the maximum permissible train speed at the time of the accident was 90 mile/h, reducing to 80 mile/h between the tunnel and the scene of the accident. The line between Hassocks and Preston Park is operated on the Track Circuit Block system with colour-light signals dating from 1932. Train description is by magazine type train describers. Hassocks Signal Box is normally switched out and opened for engineering works or emergencies and working was therefore between Keymer Crossing and Preston Park boxes. Between Keymer Crossing and Preston Park,signals were mostly of 3-aspect type, the exceptions being a 2-aspect distant signal located in ClaytonTunnel and two 4-aspect signals between a point just to the north of Patcham tunnel and Preston Park, one of these being Signal CA.4 at which the 21.50 London-Brighton train was at a stand when it was struck. All signals were located on the left of the line to which they referred. Between stations, all signals were automatic in operation although some, such as Signal CA.4, could be placed to Danger by the signalman by means of emergency replacement switches. The aspects of automatic signals were not indicated in the signal boxes. None of the signals was equipped with the British Railways Automatic Warning System. The lamps used in the signals were of 12 volts, 25 watts, 3-pin, double filament type with the designation SL.17. In this lamp both the main and auxiliary filaments are alight simultaneously and reliability depends on regular lamp changing within the normal life of the filaments and on under-running of the lamp, that is the voltage applied is always less than the nominal 12 volts. Failure of one or both of the filaments in automatic signals is not indicated in the controlling signal box and complete failure of a lamp does not lead to the signal in rear being placed to Danger as it does in more modern signalling. At the time the signalling was installed, in 1932, it was the practice to include a sighting distance in the calculation of braking distances and hence the distance between signals could in some cases be less than the normal service braking distance. Modern practice is to provide at least a full service braking distance between signals. The distances between the signals concerned in the accident were marginally below, those that would be required under modern practice. Between Signals CA.164 and CA.6 the distance is 1,333 yards whereas. after allowing for the falling gradients, the present-day requirement would be 1,370 yards. Between Signals CA.6 and CA.4 the corresponding figures are 1,320 yards and 1,395 yards. The question of emergency braking distances is discussed in paragraphs 35 and 36. The 21.50 London (Victoria) to Brighton train was formed of three 4-car express units, marshalled C1.421 (4-CIG) unit 7364, C1.420 (4-BIG) unit 7033, and (3.421 (4-CIG) unit 7333. Each of the Class 421 units comprised a Driving Trailer Composite, a Trailer Saloon Second, a non-Driving Motor Saloon Brake Second and a Driving Trailer Composite. The Class 420 unit comprised a Driving Trailer Composite, a Trailer Buffet, a non-Driving Motor Saloon Brake Second, and a Driving Trailer Composite. The overall length of the train was 797 ft and its tare weight 455 tonnes. The 21.40 London (Victoria) to Littlehampton train was formed of two 4-car express units marshalled C1.421 (4-CIG) unit 7365 and C1.420 (4-BIG) unit 7037. The overall length of the train was 53lft. its tare weight was 305 tonnes and the available brake force was 259 tonnes. The 21.40 service was arranged to divide at Haywards Heath, the front two units continuing to Littlehampton and the rear unit forming the 22.29 stopping service from Haywards Heath to Brighton. The coaches in both trains were of modern all-steel construction with buck-eye couplings and Pullman-type gangways throughout. They were built at various dates between 1965 and 1970. Both trains were fitted with electro-pneumatic and Westinghouse automatic air brakes. Their maximum service speed was 90 mile/h. When the 12-car Brighton train stopped at Signal CA.4 its driver applied the electro-pneumatic brake and kept it applied. With the front of the train just behind the signal; the tenth coach was standing partly under Sweet Hill Bridge and the eleventh and twelfth coaches were to the north of the bridge. The rear coach was struck by the Littlehampton train which, although under full braking was still travelling at between 45 and 50 mile/h. 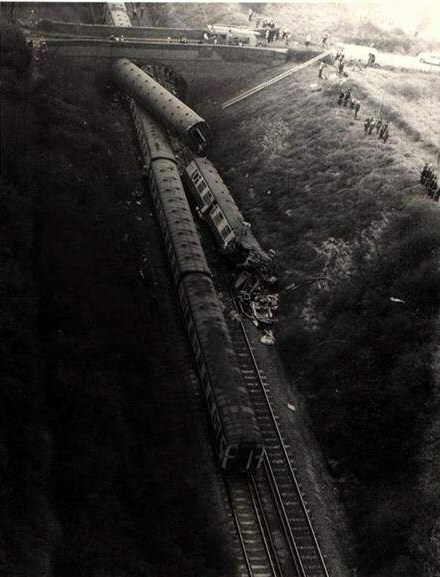 On impact, the twelfth coach of the Brighton train was deflected to the right across the Up line and the eleventh coach was thrown into the air with its leading end against the north side of Sweet Hill Bridge. The leading coach of the Littlehampton train passed under the eleventh coach and continued into and under the tenth, its passage at this point becoming constrained by contact between the top of the tenth coach and the underside of the bridge. When the Littlehampton train came to rest, what remained of its leading coach was under the tenth coach of the Brighton train, the rear parts of both these coaches being under Sweet Hill Bridge. Immediately to the north of the bridge came the second and subsequent coaches of the Littlehampton train, still in line and on the rails. The eleventh coach of the Brighton train was lying at an angle on top of the second coach of the Littlehampton train and the twelfth Brighton coach was diagonally across the Up line, alongside the third coach of the Littlehampton train. All coaches of both trains sustained damage. 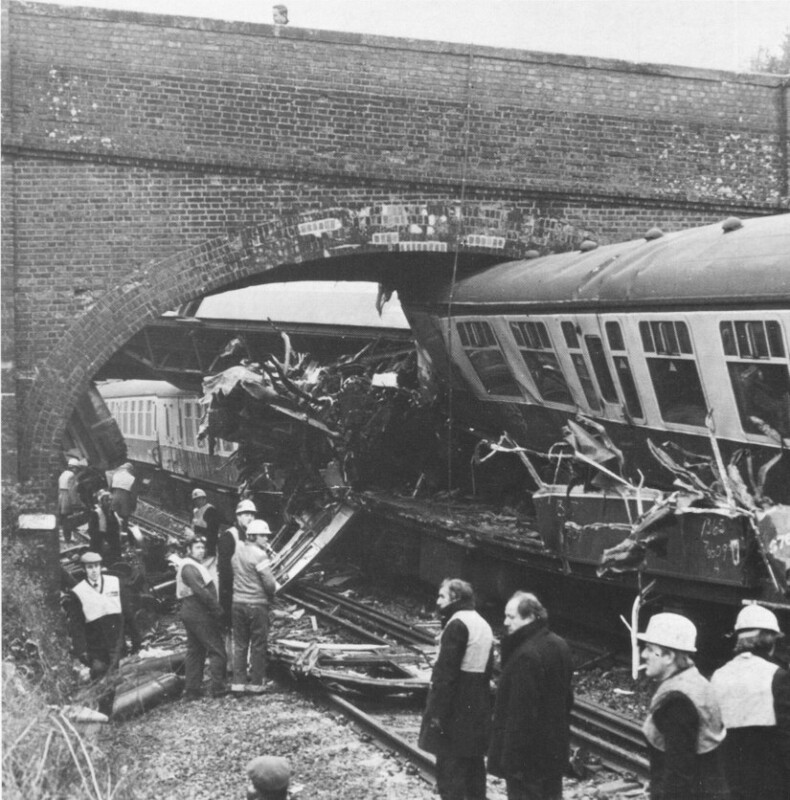 In the Brighton train the leading 8 coaches showed damage caused by the violent shock - vestibule buffer stop guide face plates bent, sliding doors off their runners, and some seats displaced. 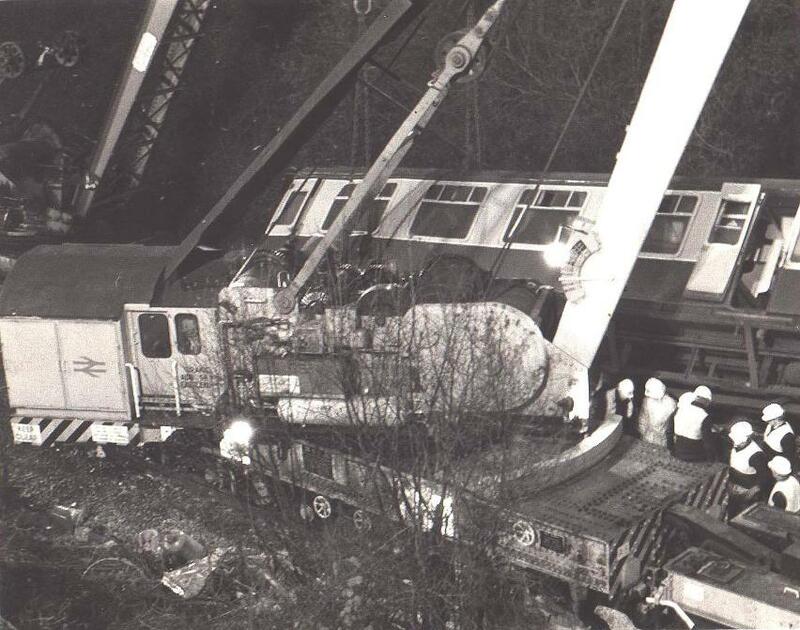 The ninth coach was derailed at its trailing end with some internal damage but with little or no damage to the bodywork. 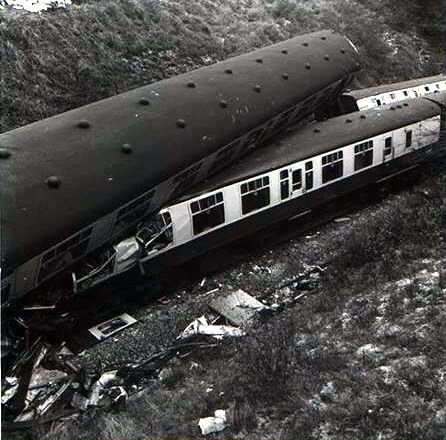 The tenth coach, resting on top of the remains of the leading coach of the Littlehampton train, was badly damaged with the body twisted and racked and interior fittings displaced and damaged throughout. The trailing end, wedged under the bridge, was crushed and split open. 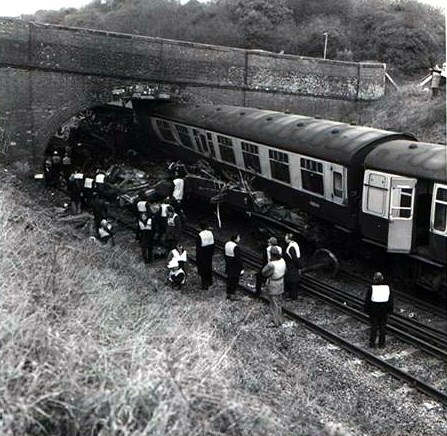 The eleventh coach, derailed and on top of the second Littlehampton coach and with its leading end in contact with the bridge, was slightly less damaged than the tenth, but damage was still extensive. The twelfth coach, which had taken the initial impact, had had its bogies and wheels torn off, underframe members buckled and split, and the body totally demolished at the trailing end. 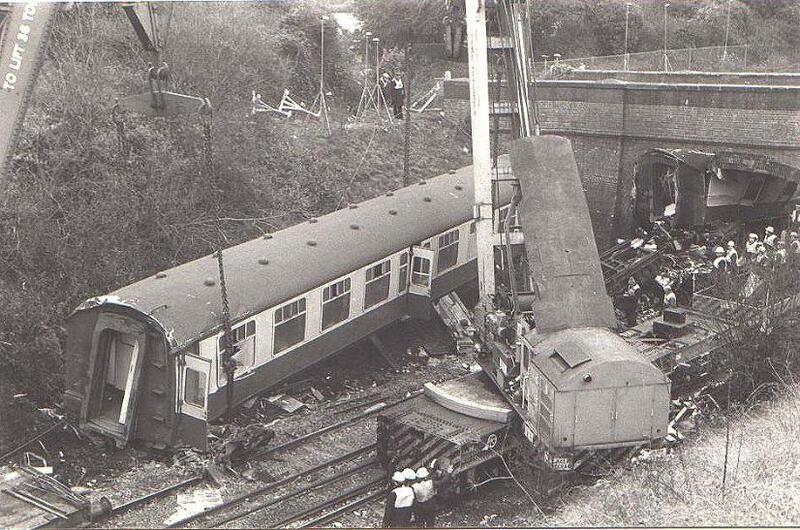 Of the vehicles in the Littlehampton train, little remained of the body and interior of the leading coach, only the damaged underframe and floor and odd sections of the body side remaining, crushed under the tenth coach of the Brighton train. 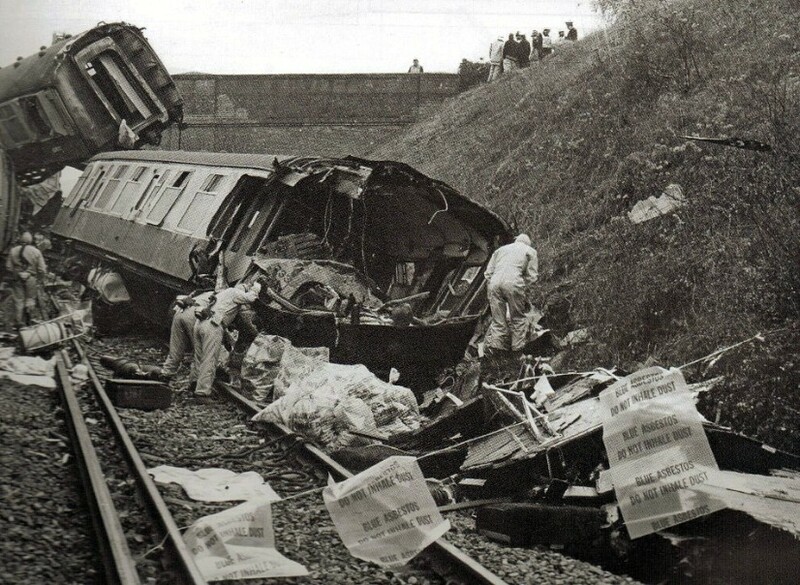 The body of the second coach was demolished at its leading end with the interior wrecked throughout the length of the coach. 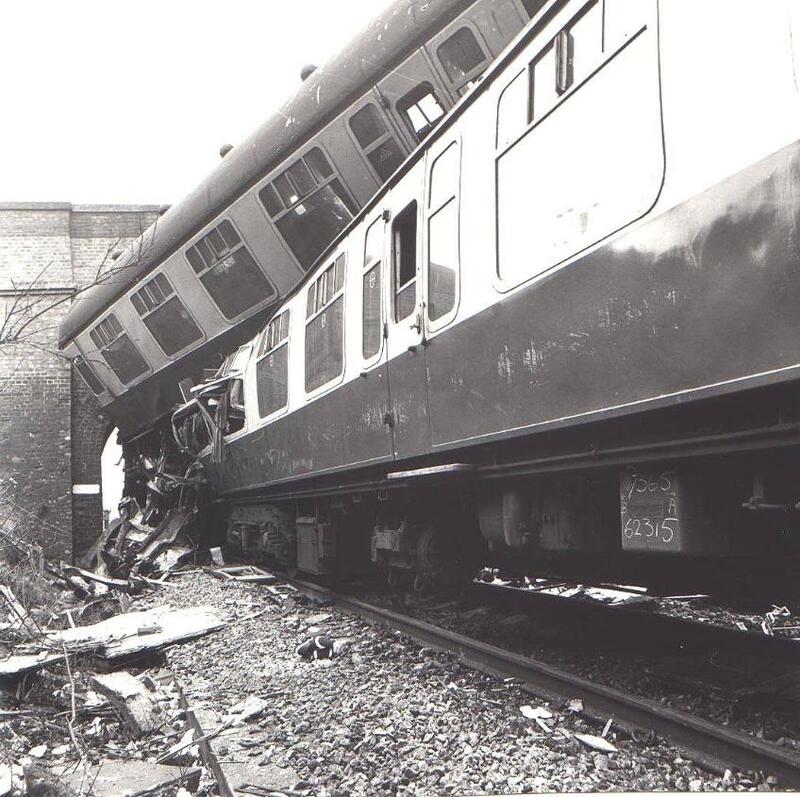 Damage to the remaining 6 coaches was much less severe, being confined in the main to shock damage similar to that in the leading 8 coaches of the Brighton train. During 19th December several incidents in the Victoria area resulted in delays and disruption to services. These included a displaced conductor rail, a track circuit failure, and a bomb hoax. As a consequence, evening trains on the London-Brighton line were running up to 45 minutes late, some services were being terminated short of their destinations, and others were cancelled. One result of the disruption was that the 21.50 Victoria to Brighton service was running ahead of the 21.40 Victoria to Littlehampton service. The Divisional Manager of Southern Region's Central Division, Mr. D. C. R. Mackmurdie, described how, at about 23.00 on 19th December, a 73 year old woman arrived by train at Brighton, apparently asleep. She awoke when the train lights were turned off but instead of walking towards the barrier she went in the opposite direction to the end of the platform and down on to the track. She had been drinking. She was observed by a member of the platform staff who, fearing that she might touch the live rail, telephoned the signalman in Brighton Signal Box and asked for the current to be switched off. Signalman D. L. Symes received this message and contacted the Electrical Control at Three Bridges at 23.1 1. Although Symes had specified the London end of Platform 3, the Controller said that he would isolate "the lot''. Symes informed the signalmen at Preston Park and Portslade of the isolation so that they could prevent trains running into the isolated area. The woman was escorted from the line, Symes reported this to Three Bridges and the power was restored at 23.21. Shortly afterwards he received a telephone call from the signalman at Preston Park saying that there had been an accident and asking him to call the emergency services. Signalman C. Packham was on duty in Preston Park Signal Box. At about 23.12 he was told by Signalman Symes of the electrical isolation and advised not to let Down trains go beyond Preston Park sub-station. At this time the 21.50 Victoria to Brighton train had been described by Keymer Crossing but Packham had not yet cleared his controlled signals for this train, it being still north of Hassocks. He decided to hold it at Signal CA.4. The alternatives would have been Signal CA.8, immediately north of Clayton Tunnel, or Signal CC.11, the Preston Park Home signal. The train was, however, already approaching CA.8, and CC.11 was very close to the sub-station at Preston Park; Signal CA.4 thus appeared the best place at which to hold the train. Having replaced CA.4 to Danger, he observed on the illuminated diagram the train approach and stop at it. At the time the 21.50 train came to a stand at Signal CA.4, the next Down train, the 21.40 Victoria to Littlehampton, was already on the diagram in the Hassocks area. There was also an Up train, the 22.40 Brighton to Victoria in the Preston Park area. The driver of this train telephoned to ask why the traction current had been cut off and shortly afterwards Symes telephoned from Brighton to say that the current had been restored. The Up train began to move towards Patcham, the Up line signals having remained at Green. Very soon afterwards an incoming call from the telephone at Signal CA.4 was indicated on the telephone concentrator. The caller identified himself as the driver of the 21.50 train and informed Packham that a following train had collided heavily with the back of his train. Packham sent the 'Obstruction Danger' hell signal to Keymer Crossing and asked the Brighton signalman to call the emergency services and direct them to the line at Sweet Hill Bridge. He replaced Signal CA.8 to Danger. As far as he could remember the call from the driver of the 21.50 train advising him of the accident was the first and only call he received from Signal CA.4. When Packham replaced Signal CA.8, immediately north of Clayton Tunnel, to Danger the next Down train had already passed it and was in the tunnel. This was the rear part of the 21.40 ex Victoria which divides at Haywards Heath, the front portion forming the Littlehampton service and the rear portion was already occupied by both the previous trains. Soon afterwards the guard of the stopping train telephoned and said they were at a stand with another train immediately ahead of them. He reported that the last signal seen by his driver had been Signal CA.164, displaying a single yellow aspect. Packham, who had worked in Preston Park Signal Box for some five years, confirmed that it would be very unusual for trains to be stopped by signals between Hassocks and Preston Park. It had been necessary for him to stop a Down train at Signal CA.8 two or three weeks before the accident but this had been the result of an incident involving an Up train; normally he would work for months without having to stop a train between Hassocks and Preston Park. Signalman J. G. Keys, on duty in Keymer Crossing Signal Box, booked the 21.50 Victoria to Brighton as passing at 23.10. From his box he could not see the back end of Down trains, thus he could not say whether or not the rear blind was lit. The next Down train was the 21.40 Victoria to Littlehampton, which passed at 23.16. He gained the impression that this train was travelling somewhat faster than normal, as if the driver was trying to make up time. This train was followed by the 22.29 Haywards Heath to Brighton stopping train which passed at 23.20. At 23.23 he received the 'Obstruction Danger' bell signal from Preston Park and replaced his signals to Danger. The driver of the 21.50 Victoria to Brighton train was Driver H. C. H. Mitchell (Brighton). He had driven trains on the London-Brighton line for over 25 years. On 19th December the 21.50 left at about 21.58 and the journey as far as Hassocks, where they were booked to stop, was uneventful. Signal CE.15, at Hassocks_ was at green, as were the following three signals; CA.8, CA.l64R, and CA.164. Passing Signal CA.164 the train was travelling at about 60 mile/h and the speed then increased to about 65 mile/h until Signal CA.6 came into sight. This signal was showing a single yellow aspect and Mitchell shut off power and allowed the train to coast. When Signal CA.4 came into sight it was at red and Mitchell had no difficulty in stopping at it, using a normal service brake application. He had had no difficulty in seeing any of the signals. He had stopped the train using the electro-pneumatic brake and, leaving this applied, he got down from the cab and telephoned the signalman at Preston Park. The signalman answered promptly and told him about the woman on the line at Brighton and the isolation of the traction current. Mitchell was about to climb back into the cab when the train suddenly moved forward and he heard a muffled noise from towards the rear of the train. After conferring with his guard via the loudaphone equipment in the cab he telephoned Preston Park again and told the signalman that he suspected that another Down train had collided with his own. He then went forward to protect his train, taking detonators but failing to take the track-circuit operating clips that were available in the cab. Mitchell thought that the time between his coming to a stand at Signal CA.4 and the collision was between three and four minutes. Before leaving Victoria he had gone to the rear cab to release the hand brake and at this time the red blind was correctly illuminated. Guard R. Vincent confirmed Driver Mitchell's account of the journey. He too had seen the rear blind correctly illuminated before the train left Victoria. When the collision occurred he was in the sixth coach from the front. After the impact all lights in the train had gone out and he made his way to the rear assisting the passengers where he could. From the back of the train the way was blocked by debris under the bridge but he met the guard of the following train who told him that another member of the staff had gone back to protect the obstruction. The guard of the 21.40 Victoria to Littlehampton train was Guard C. G. Wadey who had worked on the London-Brighton line for some 25 years. During the last 14 years of this period he had often worked with Driver Jefford, who was driving the train that night. Because of the disruption at Victoria, the stock to form the 21.40 arrived late. From the rear cab Wadey assisted the driver with the brake test and the train left approximately 45 minutes late. He had not seen his driver, who was already at the front end when he joined the train; their only communication had been via the loudaphone equipment. Stops were made at East Croydon, Gatwick, and Haywards Heath where the train divided. Here a further brake test was made on the front portion, again with satisfactory results. They left Haywards Heath still about 45 minutes late for the run to Hove, their next scheduled stop. Between Haywards Heath and Clayton Tunnel Wadey considered their speed to have been about normal and coming out of the tunnel he estimated the speed as about 60 mile/h. Shortly after leaving the tunnel he felt the driver make a slight application of the brakes and could hear the brakes just rubbing. The speed of the train was not significantly reduced. Shortly afterwards the brakes were applied in what was obviously a full emergency application - Wadey swung round in his seat and looked at the brake gauge and saw that the train brake pipe pressure was already zero, indicating a full brake application. About 10 seconds after the initiation of the emergency application the collision occurred. Between the emergency application of the brakes and the collision the train's speed had been reduced, possibly to about 45 mile/h. So far as he could remember the train was coasting and not under power after leaving Clayton Tunnel. After the collision the emergency lighting came on in the train. He took his hand lamp and detonators and went forward through the train. It did not occur to him to take the track-circuit operating clips that were available in his van. After re-assuring the passengers and seeing the extent of the damage he went to the rear of his train and saw that another Down train was standing a short distance behind. The driver of this train told him that the last signal he had passed had been showing a single yellow aspect. The guard of this third train said that he would go back and protect the Down line so Wadey once again made his way forward. Approaching Sweet Hill Bridge he saw the signal (CA.4) beyond the bridge displaying a red aspect. Mr. A.I. Everson, a BR Controller at Croydon, was travelling as a passenger in the 21.40 train. He was a regular traveller on the London-Brighton line and for 15 years before becoming a Controller he had driven trains on this line. He was travelling in the fourth coach from the front, on the off side facing the rear and not over a bogie. So far as he could remember the train's speed after leaving Haywards Heath was not excessive. He thought the speed in the tunnel was between 55 and 60 mile/h, increasing to between 65 and 70 mile/h after leaving the tunnel. He was quite unaware of any brake application before the collision and, whilst he agreed that he might have missed a light application of the brakes, he felt that if an emergency application had been made and had been maintained for more than a second or two before the collision, he would have noticed it and remembered it. 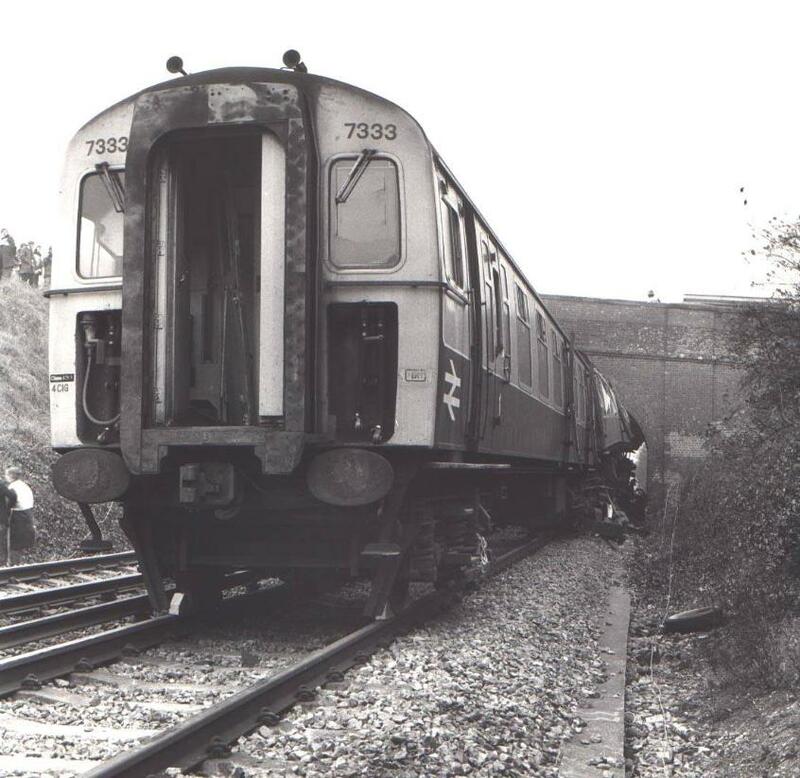 The rear portion of the 21.40 train, which was divided at Haywards Heath to form the 22.29 stopping service to Brighton, was taken over by Driver R. D. M. White (Selhurst) and Guard J. S. Gledhill. After a satisfactory brake test they left Haywards Heath and stopped at Wivelsfield, Burgess Hill, and Hassocks. On leaving Hassocks, Signal CE.15 was showing a single yellow aspect, as was the next signal, CA.8. Just before entering Clayton tunnel the cab indications showed that the electric traction had been lost. With the speed at about 40 mile/h. White allowed the train to continue, passing Signal CA 164R in the tunnel at yellow; and the speed had dropped to about 25 mile/h or less when they emerged from the tunnel on to the falling gradient. Signal CA.164 was showing a single yellow and White applied the brakes, holding the speed to about 20 mile/h. He was looking ahead for Signal CA.6 but saw no sign of it and then saw the red blind at the back of a train some distance ahead. Someone was walking towards him carrying a white torch light so he allowed the train to roll slowly forward and stopped about 30 yards from the back of the other train. When the traction current had been lost, Driver White had called Guard Gledhill forward to the front cab. After the train had stopped Gledhill got down and met Guard Wadey who told him what had happened. Gledhill agreed to go hack and protect his train. On going back he came to Signal CA.6 which was showing no light at all: all three aspects were out. He placed detonators on the line opposite the signal and used the signal post telephone to speak to the Preston Park signalman. The latter already knew about the collision; Gledhill did not tell him that Signal CA.6 was out. Continuing northwards he telephoned the signalman at Keymer Crossing from an Up line signal and then reached Signal CA.164, which was showing a single yellow aspect. He put down detonators opposite this signal and again telephoned the Preston Park signalman. The 22.40 Brighton to Victoria train was driven by Driver J. W. Southon (Brighton). Earlier he had worked the 21.36 service from Three Bridges to Brighton and this train had preceeded the 21.50 Victoria to Brighton. Between Clayton Tunnel and Preston Park he had been closely following another train and each 7 of the signals, including Signal CA.6, had been displaying single yellow aspects. After leaving Brighton with the 22.40 train he lost the traction current in the Preston Park area but was able to coast into the station. After the current had been restored he continued towards London but was stopped at Signal CA.1, south of Patcham Tunnel. Mr. W. R. Tubb, the Area Signal Manager, Brighton, had held this position since 1972. 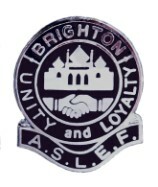 On the London-Brighton line his area of responsibility extended from Brighton to the north end of Clayton Tunnel. At about 23.45 on 19th December he was informed whilst at home that two trains had collided north of Preston Park. He went to Preston Park Signal Box where the signalman gave him the facts as he knew them. Mr Tubb noted that No. 4 track-circuit on the Down line was showing 'Occupied' with adjacent track-circuits clear. The replacement switch for Signal CA.4 was in the 'Replaced' position. Accompanied by his assistant, Mr Button, he went to the site, arriving at about 00.45. He noted that the front of the 21.50 train was about a yard past Signal CA.4, which was at Danger. He then went to the north of Sweet Hill Bridge where he was joined by two of his technicians. Arriving at Signal CA.6 he saw that all three aspects were out. He checked the relevant relays at the signal and found that the relay for No. 4 track-circuit was correctly de-energised in the 'Occupied' position and that the relay controlling the red aspect of the signal was also correctly de-energised. He next checked the voltage at the terminals of the red aspect lamp holder and found the voltage both present and at the correct strength. He decided not to touch the lamp at this stage and informed the Preston Park signalman of the situation. The signalman told him that Mr Garven, the Southern Region Signal Engineer (General), was at the signal box and would be coming to the site. Whilst waiting for him to arrive, Mr Tubb tested the insulation of the cables between the relay apparatus case and the signal and found it satisfactory. When Mr Garven arrived, accompanied by Mr Cracket, the Divisional Signal Engineer, further tests were made on the red aspect lamp. It was at once found that if the lamp was moved slightly in the lamp holder it would illuminate, with both filaments alight, but that as soon as the light finger pressure needed to make contact was removed the lamp would go out. This showed that there was a high resistance contact between the lamp and the springs in the base of the lamp holder which supply the voltage to the lamp. The cause of this high resistance was not immediately apparent. The lamp was removed for further testing and replaced by another lamp which illuminated correctly. On 21st December, before the line was re-opened to traffic, the complete signal head was removed for testing; before this was done a check was made on the aspect sequence of Signal CA.6 and the signals in rear and these were found to be correct. Mr Tubb explained that the lamps fitted in Signal CA.6 and similar signals on the London- Brighton line were of double filament type, with the main and auxiliary filaments connected permanently in parallel. The auxiliary filament was of lower wattage than the main, giving it on average a longer life. Should the main filament fail, the auxiliary filament would give a reduced light which should be noticed and reported by drivers. If the signal was a controlled signal it would be indicated in the signal box and the signalman should also he able to detect that the light was less bright, indicating a main filament failure. Failure of even one filament was, however, a very rare event since lamps were changed after 4,000 hours, that is about every six months. In Mr Tubb's experience, any defective lamp, or high resistance contact in the lamp holder, would be discovered when the new lamp was inserted: provided it functioned correctly then, it would be most rare for it to fail in any way during the following six months. He had never previously known a case where both filaments had failed to light after a lamp had once been satisfactorily installed. In the specific case of the lamps in Signal CA.6_ his records showed that all lamps had been changed on 26th October 1978, that is just under eight weeks before the accident. Senior Technician H. J. Gander was responsible for the routine maintenance of signals between Brighton and the north end of Clayton Tunnel. He had worked on the London-Brighton line for 28 years. He had personally changed all the lamps in Signal CA.6 on 26th October 1978 and, in accordance with the standard procedure for changing lamps, had examined the spring contacts for signs of dirt, corrosion, or slackness and had checked the proper illumination of each of the three aspects after fitting the new lamps. On 29th November 1978 he had carried out routine maintenance on Signal CA.6. This. again in accordance with the standard procedure, involved cleaning the inside and outside of the three aspect glasses and the signal number plate. Whilst cleaning the glasses he felt each of the lamps in turn to make sure that they were seated properly in the lamp holder. As a final check he observed that each aspect was functioning correctly, using his key, with the signalman's permission, to obtain a red aspect. During the 28 years he had worked on signals on the Brighton line he had known occasions when high resistance contacts had developed between lamps and lamp holders. Because of this he always tried to ensure a good contact when changing a lamp. He could not remember the last time that he had actually found a high resistance contact; it had been a long time ago. Evidence on the examination of the signal head from Signal CA.6 was given by Mr V. Brown, Acting Chief Signal and Telecommunications Engineer, Southern Region. The head was first examined for general cleanliness, condition of contacts, and insulation of the transformer. These were found to be correct, except that on the red aspect lamp holder there were signs on the two contact fingers. and on one of them in particular, of slight arcing and a consequential slight roughening of the metallic surface. On the associated lamp there was a small area with a roughened black surface on one of the two soldered 'pips' on the base of the bayonet cap. Measurement of the pressure exerted by the spring contacts on the base of the lamp showed this to be marginally on the light side. The examination thus suggested that, due to a slightly light contact pressure, arcing had occurred on the base of the lamp and this had built up with repetitive switching until the contact resistance increased sufficiently to prevent the lamp illuminating. It was further found that the degree of arcing on the contact fingers was insufficient on its own to lead to lamp failure; when a new lamp was placed in the holder it lit every time. These preliminary conclusions were confirmed bp subsequent laboratory tests which showed an area of high resistance between the lamp and the lamp holder that could have been caused by resistance heat or sparking. There was no evidence of extraneous metal or material associated with the spring or contact area which might have caused the high resistance. The lamp holder itself was, as already stated, somewhat lacking in spring pressure in making contact with the lamp, and this could well have been sufficient to cause intermittent arcing. Details of the examination of the trains were given by Mr J. E. Vine. Mechanical and Electrical Engineer (Running Maintenance) Southern Region. It had proved possible to carry out a full brake test on the 21.50 Brighton train and the results were satisfactory. Similarly, the brakes on the 4 cars of the 22.29 Haywards Heath-Brighton train, which had originally formed the rear end of the 21.40 Littlehampton train, were tested and found to be in order. Of the 8 coaches forming the 21.40 train, the leading two were so severely damaged that no brake test could be made of the train as a whole. Tests were, however, made on the remaining 6 coaches and these were found to be in good working order. 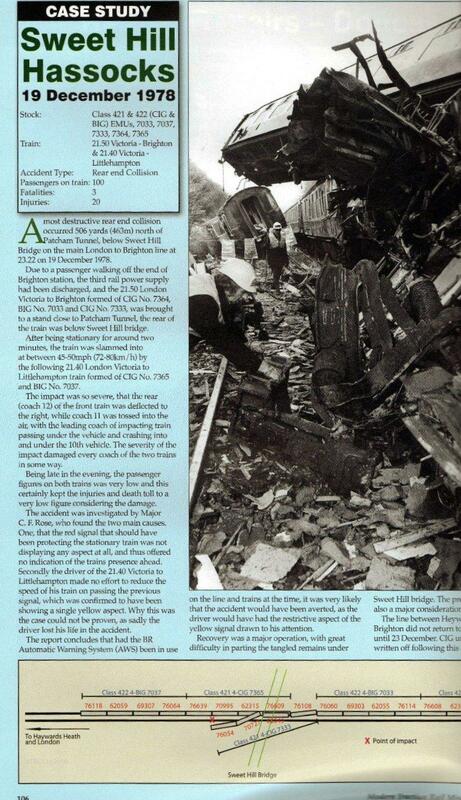 During a visual inspection of the brake blocks, slack adjusters and other parts of the braking system on the leading 2 coaches, Mr Vine found nothing to suggest that the brakes were other than in proper working order at the time of the accident. This involved running the train as far as possible in accordance with the available evidence as to speed, braking, etc. For the test it was assumed that the train had been running with the master controller in the notch 4 position immediately prior to the emergency brake application. Hassocks was passed at 68 mile/h, Clayton Tunnel was entered at 70 mile/h and power cut off as the train passed Signal CA. 164R, the speed then being58 mile/h. The brakes were then lightly applied and the speed had dropped to 53 mile/h as the train left the tunnel. The master controller was then opened to notch 4 and Signal CA.6 passed, the aspects on the signal having been deliberately extinguished. On sighting a red light placed where the rear blind of the 21.50 train would have been the DSD was released, the speed then being 50 mile/h. The train stopped in 286 yards from the point where the DSD was released, the front of the train being still 132 yards short of the red light. The sighting distance of the red light was measured as 418 yards. In this test an experienced driver was asked to drive exactly as he would with a train running non-stop from Haywards Heath to Brighton, or Hove, observing all signals. Signal CA.6 was maintained at Danger. Hassocks was passed at 66 mile/h, Clayton Tunnel was entered at 68 mile/h and the speed had risen to 70 mile/h at the exit. Power was then shut off and the brakes lightly applied as Signal CA.164 was observed showing a single yellow aspect. Between Signals CA.164 and CA.6 brake applications were made giving brake cylinder pressures of 20, 30 and 10 psi successively, the train coming to a stand without difficulty at Signal CA.6. In this test Signal CA.6 was extinguished and a red light represented the rear of the 21.50 train as in Test 1, but this time the train was driven at maximum possible speed. Hassocks was passed at 76 mile/h, Clayton Tunnel entered at 74 mile/h and power applied all the way through, the speed on exit being 72 mile/h. Power remained applied until the speed had risen to 78 mile/h when the controller was closed. Speed had only dropped to 77 mile/h when, having passed Signal CA.6, the red light was sighted. An immediate release of the DSD reduced the speed to 58 mile/h at the red light, to 30 mile/h at Signal CA4_ and the train stopped with its front end 66 yards beyond this signal. To supplement these practical tests Mr Vine produced a number of theoretical curves based on the known train performance and braking data. They assume a train formation identical to that of the 21.40 train, with a 10 per cent passenger load, as estimated for the train in question, and a line voltage of 675 volts. With the train on full power the speed passing Hassocks was calculated to be just above 70mile/h, the speed through the tunnel as just fractionally below 70 mile/h and thereafter increasing to 73 mile/h at Signal CA. 6.These speeds may be compared to the actual speeds recorded during Test 3, the fact that the actual speeds were higher being due to the test train being empty and running during the night when the traction voltage may have been above 675 volts. The curves are shown in Figure 4 opposite. The first curve (A) assumes an impact speed of 54 mile/h, the speed at which the speedometer needle jammed. If the train had been under full power, the emergency brake application would have been initiated 393 yards before the back of the 21.50 train. This should be compared with the 418 yards sighting distance to the rear blind of this train. The duration of the emergency application would have been 12 seconds and this should be compared with Guard Wadey's estimate of a 10 second emergency brake application before the collision. The second curve assumes that the train was under full power but that the emergency application was just able to bring the train to rest before it hit the train in front. To do this the braking would have had to be initiated 715 yards in rear of the other train, that is at a greater distance than the available sighting distance. The third curve (C) assumes that the train is driven past Signal CA.164 under full power and an emergency application made as Signal CA.6 comes into sight, at red, the normal sighting distance to this signal being 300 yards. This shows that the train would over-run the signal by 385 yards but would stop 690 yards clear of a 12-car train stopped at Signal CA.4. The final curve (D) shows the effect of a non-cancelled AWS warning at Signal CA.6 and shows that from a speed of 72 mile/h the train would be brought to a stop in 697 yards, that is 381 yards short of the train ahead. The accident was caused by the unfortunate combination of two failures, one mechanical and one human. The mechanical failure was that of the red aspect light in Signal CA.6. This signal should have been protecting the rear of the 21.50 Victoria to Brighton train but it was out. Without it the drivcr of the following train, Driver Jefford, was denied a positive indication of the start of the occupied section and the mark where he should have stopped his train. Had the signal been correctly showing a Danger aspect, o r had it and the train been provided with the automatic warning system (AWS). I do not think that the accident would have occurred. The human failure was that of Driver Jefford to react as he should to the warning given by the previous signal, Signal CA.164, which I am satisfied was showing a single yellow aspect when he passed it. The meaning of a single yellow aspect, as stated in the British Railways Rule Book, is "Caution -Be prepared to stop at next signal". All the evidence, from those on the train and from thc practical and theoretical studies of train running, points to the fact that after passing Signal CA.164 Driver Jefford allowed his train to continue without significant reduction in speed until the other train came into view. The probable speed at impact: together with Guard Wadey's clear and convincing evidence regarding the emergency brake application, suggests strongly that the train was still travelling at something over 60 mile/h when it passed the unlit Signal CA.6 and when thc illuminated red blind at the rear of the stationary train came into view, some 660 yards beyond the signal. Driver Jefford was an experienced driver; he knew the line intimately and had last signed for the route on 20th March 1978. Had he reduced his speed after passing Signal CA. 164 he should have realised that Signal CA.6 was 'missing' and have acted in accordance with Section E.8.2 of the Rule Book, which instructs a driver to treat the absence of a signal (at a place where one is ordinarily shown) as a Danger signal. It will never he known why Driver Jefford did not reduce speed after passing Signal CA.164. There was nothing to suggest that he was other than fit and alert during the journey from London. It may be that, as an experienced driver, he considered that he could continue at speed and still be able to stop within the sighting distance of Signal CA.6. The actual sighting distance of the signal from a driver's position is 300 yards but at night the reflection of the signal light on the polished rails can be picked up whilst the actual signal is still hidden by the curve and this considerably increases the effective sighting distance. Alternatively, he might have thought that there was another train travelling ahead of him at much the same speed as his own, a common enough occurrence on the London-Brighton line, and thus expected Signal CA.6 to have cleared to yellow or even to green by the time it came into sight. A third possibility is that he might have been momentarily distracted in some way and either missed or failed to react to the warning given by the yellow aspect in Signal CA.164; this, however, must remain pure speculation since there was no evidence to suggest that anything in the cab, or outside the train, might have diverted his attention at the critical time. Given the nature of the signalling on the London-Brighton line at the time of the accident, the failure of the red light in Signal CA.6 could have happened, and remained undetected, for sometime, no matter how well the signals were maintained. It would have been rare for a train to be stopped at this signal and, since the automatic replacement to Danger occurs after the front of a train has passed the signal, the red aspect might not have been seen by a driver for days, or even weeks, on end. In my view the standing arrangements for maintenance of the signals were reasonable and adequate and no blame attaches to the signalling staff responsible for carrying it out. Nor can there be any criticism of the signalmen and others involved in dealing with the previous incident at Brighton Station; they acted properly and sensibly. My only criticism concerns the widespread failure of train crews to use the track-circuit operating clips provided in order to protect the lines obstructed by the accident. The use, or more often the non-use, of these clips on Southern Region has been the subject of discussion by the lnspectorate and the Railways Board. The circumstances of this accident reinforce the Inspectorate's view that more is needed to make train crews aware of the importance of immediate use of these clips after a train accident, and 1am glad to report that Southern Region have posted reminder notices in driving cabs and guards' compartments, adjacent to the clips, and are conducting a poster campaign to emphasise the vital need to use the clips in emergency. The signal that failed, Signal CA.6, was an automatic colour-light, installed in 1932 and fitted with SL.17 type lamps. As explained in paragraph 3, failure of one or both of the filaments in this type of lamp is not indicated in the controlling signal box, and complete failure of the new lamp does not place the signal in rear to Danger. Indication of first filament failure, and replacement of the signal in rear to Danger should both filaments fail. is standard practice in more modern colour-light signalling. At the present time in Southern Region there are some 1,300 controlled or semi-automatic signals fitted with SL.17 type lamps, plus a further 590 automatic signals. This approximates to a quarter of the total regional route mileage. In the case of the controlled or semi-automatic signals, the signalman has an indication on his panel or diagram that the signal is alight although failure of the light, or of one filament, is not drawn to his attention. In the case of automatic signals he has no way of telling whether the signal is alight or not. Considerable progress has been made in recent years in replacing pre-war colour-light signalling as well as in introducing colour-light signalling for the first time in areas previously equipped with semaphore signals. The major re-signalling schemes in the Feltham, Dartford, and London Bridge areas started what has become a continuing programme of signal modernisation in the Region. The current Victoria re-signalling covers some 103 route miles and authorisation has been given for the next stage- the extension of the modernisation to cover the whole of the London to Brighton Line and many of the branch lines leading from it. On present plans, the Brighton Line re-signalling should he complete by 1985 (the main section, from Earlswood to Preston Park, being done by 1982) and. taking into account other schemes already authorised or planned, by 1985 the number of signals still fitted with SL.17 lamps should he reduced to X39 controlled or semi-automatic and 437 automatic. These figures are likely to he further reduced, although only marginally, by the piecemeal changing of existing prc-war signal heads and alteration of the circuitry to achieve modern standards of lamp proving as renewals become necessary in individual cases. This programme can only be a limited one since there is no economic justification for such piecemeal replacement and the Region's technical resources are., rightly, concentrated on the major re-signalling schemes. The core of the problem is, therefore. the pre-war signalling, with its lack of full modern safeguards, which; although diminishing in extent, will necessarily remain for many years to come. Following the accident at Patcham, each of the 1.900-odd signals fitted with SL.17 lamps was specially examined and in 11 of them the lamp holder spring pressure was found to he on the weak side, although none had the high resistance condition found in Signal CA.6. Signal technicians have been directed to give special attention to spring pressures when carrying out the routine maintenance of signals, and thought is being given to producing a gauge which will measure the spring tensions. Bearing in mind the rare nature of the failure in Signal CA.6, the increased attention to spring contact pressure should reduce the possibility of a recurrence to a very low figure indeed. The curves reproduced in Figure 4 on page 11 show that an AWS-initiated brake application at Signal CA.6 would have brought the train to a stand 381 yards short of the train ahead even had it been travelling at 72 mile/h as it approached the unlit signal. This accident must. therefore, join the list of other serious accidents in Southern Region which would in all probability have been avoided had thc signals and trains concerned been fitted with AWS. 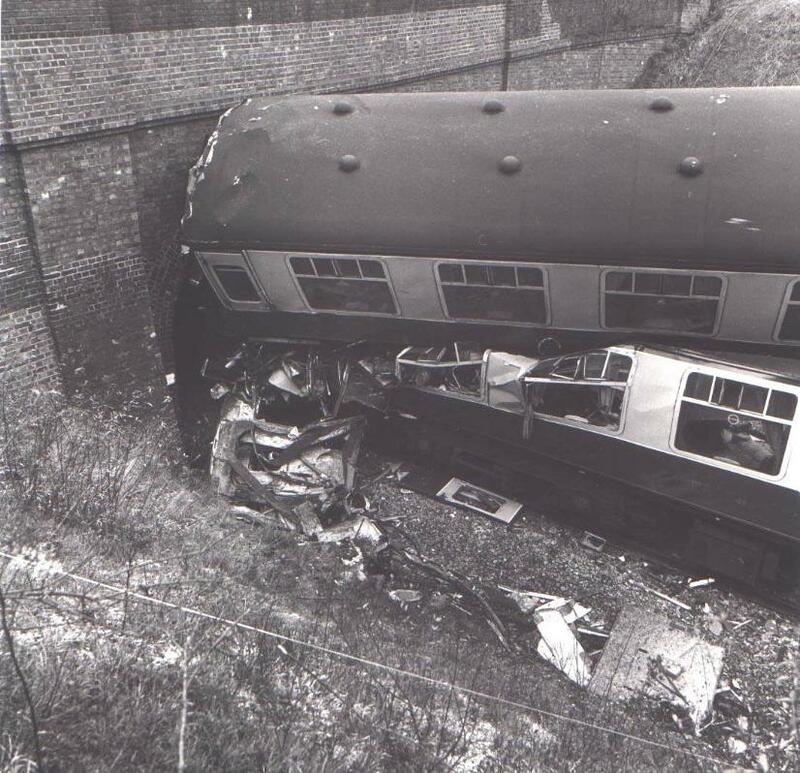 In his report on the high speed collision near Marden in January 1969. Colonel Robertson summarised the history of 4 W S in Southern Region and explained why the Region was less advanced than the rest of British Railways in the provision of A WS. The situation. 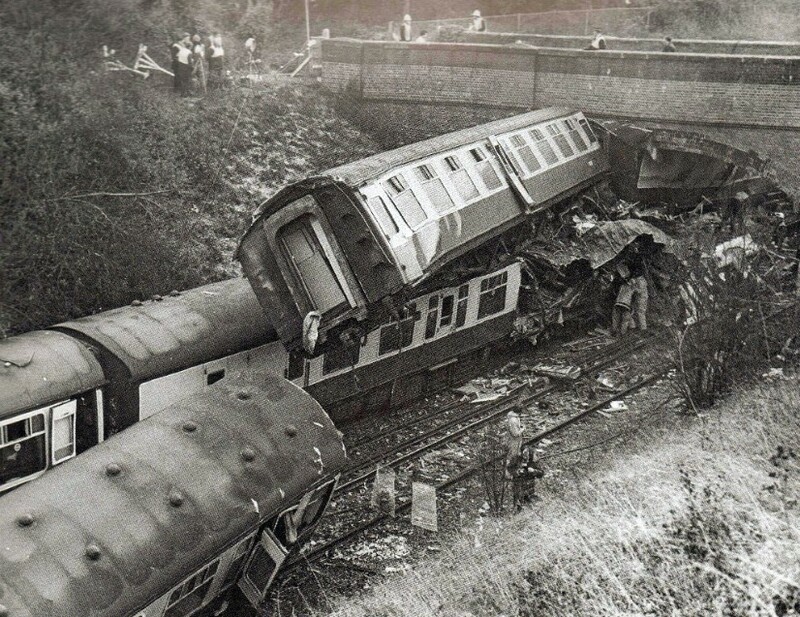 as it then existed; was also described by Lieutenant Colonel McNaughton in his report on the collision at Copyhold Junction: near Haywards Heath, on the London to Brighton Line, in December 1972. Further developments have taken place since then. In order to present a coherent account, I shall reiterate briefly the history of A\VS in Southern Region and bring the story up to date. The Automatic Warning System. .AWS. is an aid to a train driver by which, when he is closely approaching a signal, he receives an audible warning in the cab. If the signal is at green, a bell sounds and no action is required. A visual indicator in the cab displays an all-black aspect. If the signal is at Caution (double yellow or yellow): a horn sounds and continues to sound until the driver acknowledges (cancels) the warning by pressing a button. If he fails to do so the brakes are applied automatically. Pressing the button causes the cab indicator to display a black and yellow aspect and this aspect is maintained, as a reminder, until a green signal is passed. If the signal is at Danger, the horn sounds as it would at a Caution aspect and the warning can he similarly cancelled. AWS is thus, as I have said, an aid to a driver: it in no way relieves him of his responsibility to observe and obey signals. Although early forms of AWS were in use from 1900 onwards, notably on the Great Western Railway, it was not until 1956 that the then British Transport Commission authorised the start of a major programme for the installation of a standardised electro-magnetic induction design of A WS on all main lines. Since that date. nearly all the principal routes in London Midland, Eastern, and Scottish Regions have been equipped and the main Western Region lines have been converted from the old WR direct contact system to the standard British Railways inductive system. In Southern Region, however, only the South Western Division has been equipped and nearly all the main lines in the Central and South Eastern Divisions remain unfitted. 48. The reasons why Southern Region has lagged behind are complex. First there was the technical difficulty of developing a reliable version of the standard British Railways system for use on linese1ectrifie.d on the conductor rail system. This was not finally achieved until 1963, by which time the lines from Waterloo to Bournemouth and Exeter, at that time largely unelectrified, had been equipped. Second, there was some reluctance within the Region to give priority to the installation of AWS over the Region's programme to replace semaphore signalling with multi-aspect colour lights; it being their view that such re-signalling was more cost-effective in safety terms. This opinion was no doubt influenced by the high costs of installing AWS on the Southern, with its close spacing of signals and the large number of multiple-unit cabs that would have to be equipped. A third factor was the suspicion, shared at that time by the Inspectorate, that the standard British Railways AWS was not really suitable for the intensively worked, colour-light signalled sections of the Region. The equipping of the lines from Woking to Waterloo showed that, with closely spaced our-aspect signals and close head way working, drivers were having to cancel AWS warnings in rapid succession, and accidents elsewhere had already demonstrated that under these conditions the warnings could lose their significance and induce a driver to cancel subconsciously, perhaps even past a signal at Danger. Between1964 and 1973 no real progress was made towards the extension of AWS in the Region. To overcome the fears about repetitive cancellation, work was started on what became known as SR AWS (Southern Region AWS, later changed to Signal Repeating AWS). This involved the indication of individual signal aspects in the cab and required the driver to acknowledge each indication by a separate distinct action. It was based on work already being crried out by the British Railways Research Department at Derby and, if successful, would have represented a krst step towards filly automatic train operation. 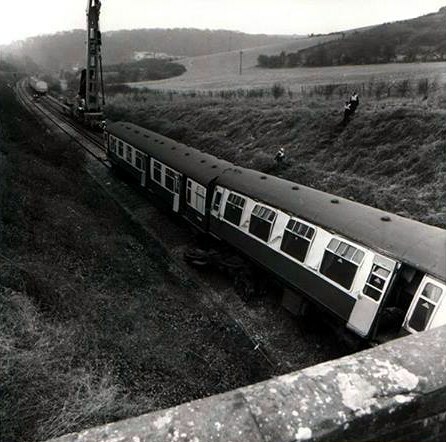 In the event, the project was beset by technical difficulties and by 1973 no fully proven system was available, whilst the costs of SR AWS had risen to nearly three times that of the standard British Railways system. Since further delay in equipping the Region with AWS was unacceptable, to the Region, the Railways Board, and the Inspectorate, the decision was taken to install BR AWS throughout the South Western Division. At the same time, development work was to continue on SR AWS and the possibility of a modification to BR AWS. eliminating the need to cancel at a double yellow aspect, was to be re-examined, this having already been considered as a possible alternative when SR AWS was first conceived. In 1975, the SR A WS project was abandoned and development effort was concentrated on the modified BR AWS. By early 1976the modified equipment, designated BR AWS Mk 2:was available. at a cost approximately twice that of standard BR AWS. However, at this stage Southern Region reported that one of the noticeable results of the commissioning of the Dartford and London Bridge re-signalling schemes was that traffic was flowing more freely, with a marked reduction in the number of consecutive restrictive signal aspects encountered by drivers. Following a careful survey to establish the degree of this improvement, the Railways Board decided that, assuming a comparable improvement would be brought about in due course by the new Victoria, and eventually by the new Waterloo re-signalling, no variation from standard BR AWS could be justified anywhere in Southern Region. At the end of 1978, with the programme to equip the South Western Division virtually complete, 436 route miles in the Region had been equipped with A WS track equipment, this representing some 34 per cent of the mileage that needed to be done in order to bring the Southern into line with other Regions. Of the 850 miles remaining, provision of AWS on 211 miles has been authorised as part of the Victoria and Brighton re-signalling schemes, now under way, together with a further 119 miles on other, smaller, schemes. This still leaves some 520 route miles to be done, and the Board has given a high priority to plans for equipping this remaining mileage. On some lines, where the braking distances are to modern standards, the fitting of AWS can proceed without delay. On others, where the existing signal post-to-post spacing does not provide a full braking distance, the fitting of AWS will have to await re-signalling. On the Board's current programme, 85 per cent of the system, covering all the main trunk routes, will be completed by 1983 and the full planned provision of AWS will he achieved by 1985. The equipping of Southern Region locomotives with AWS equipment is already largely complete and the multiple-unit stock is being done as quickly as possible so that maximum benefit can he taken of routes where track equipment is already fitted. After years of well-intentioned although, in the end, fruitless delay, during which time the Southern Region has been less well protected against the possibility of serious rear end collisions than other Regions, there is now a firm and realistic programme for bringing the Region up to standard. It is to he hoped that neither technical difficulty nor financial stringency will be allowed to stand in the way of the successful completion of the programme within the planned time scale. In accordance with your instructions I attended the above inquiry held at Hove on 12th January, 1979. I was able to speak to Bro. White before the inquiry but was unable to see Bro. Mitchell as he was not at the inquiry much before commencing time having travelled, I believe by Railway car from Brighton. At that stage I was involved in reading the mass of documents available to me as our main concern had to be firstly our deceased member, Bro. Ron Jefford and also the driver of the train which stopped clear of the crash, Bro. White who had also passed signal CA6 which was, according to the signalman at danger, but the lamp was out. bro. Mitchell was only marginally involved having stopped at signal CA4. In my cross examination of Bro. Mitchell he accepted that when he receives a “yellow” it was always not possible to apply the brake at that stage although he had applied the brakes on this occasion. He readily accepted that it depend on the distance between the signals, gradient, etc., and often drivers could run time under continual “yellows” - but this was at the driver’s discretion. The basic position was that driver Mitchell in charge of the Victoria to Brighton had the signals put at red because a lady was on the track at Brighton. He stopped at signal CA4 at red and went immediately to the telephone. 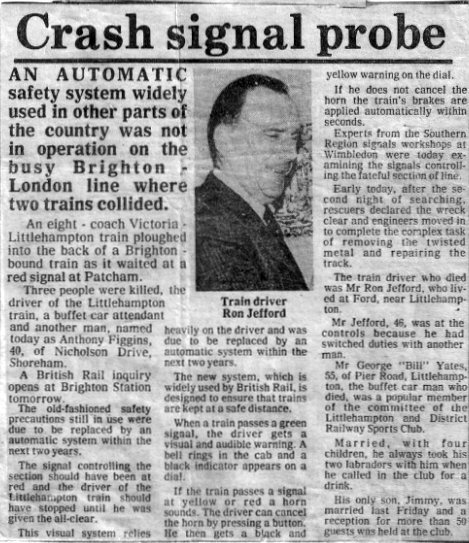 He claimed also that he went a second time to telephone but signalman Packham did not corroborate this and driver Mitchell’s view was not challenged as it was accepted that signalman Packham was under some pressure immediately after the crash and the leading up to it. The 21.40 train ex Victoria was driven by Bro. Jefford and was going to Littlehampton. The train and line speed is 85 m.p.h. at the point approaching impact. Signal John Keys would not hold to 80 m.p.h. as the speed of Bro. Jefford’s train under cross examination, even although it was permissible for Bro. Jefford to do this, if necessary. However, all the test runs made indicated that it was virtually impossible to achieve this speed because of voltage restrictions at this point. There is no doubt that signal CA6 was at danger but the lamp was out. Only Area Signal Manager Ralph Tubbs was prepared to place the final responsibility with the driver (Jefford) under rule”E” 8.2.1 of the B.R. Rule Book. Privately, Major rose does not accept this, nor was this a view put by Divisional Manager MacMurdie nor by Central Divisional Signal Manager Brown in his factual statement to the inquiry. Acting Chief Signal Engineer Brown stated that CA6 was an automatic signal. This equipment was introduced in 1932 and is obsolete. If it failed, as in this instance, because it was old equipment it would not show in the signal box but modern equipment would show. Also modern signals had a secondary filament which would take over and would also record in the signal box or the drivers would report a dim signal. If the Automatic Warning System had been introduced the accident would also have been avoided as the intended position of the signal would have activated the warning system. The signal failed according to the Wimbledon tests due to a faulty bulb holder not maintaing the bulb firmly and causing arcing which led to minute corrosion and this led to this rare failure. Bro. White our Selhurst member also passed CA6 at danger signal out but because of loss of power due to the crash was travelling slowly and stopped clear of the obstruction. It was estimate that the speed of the impact was about 50 m.p.h. and the speedometer showed 54 m.p.h. when it was broken in the crash. What remains obscure is why Bro. Jefford’s train was doing this speed when CA164 was supposed to be at “yellow” with CA6 at red yet running six minutes behind Bro. Mitchell’s train stopped at signal CA4. There may be significance that the signals were reversed for Bro. Mitchells due to the emergency on the line at Brighton but he gave the sequence of signals indicating that the “reverse” had been made before he was aware of this. In other words he stopped in proper sequence and not with a red thrown in his face. I enclose my paper and documents to be used with discretion by Robin Thompson although they well may wait for the Official Report of the accident before proceeding. This report will probably place about ninety per cent of the accident on the signal failure and will urge a speed up of signal modernisation on this very heavily used line. It is not due for complete modernisation until 1985/6. It will also urge the rapid introduction of the Automatic Warning System. It perhaps will speculate on Bro. Jefford’s speed on approach to signal CA6 as the previous signal should have been yellow (CA164) and there is 1333 yards between these signals and almost the same again to signal CA4. Finally, it may also mention that Section “E” 8.2.1 of the Railways Rule Book could have avoided this accident but only to a minor degree. Naturally it will mention that protection Rules were not operated in regard to short circuiting bars or clips and training was absent.